New Horizons is proud to offer car wash installation from installers that you can depend on. Our team of expert installers has the combined knowledge and skills to ensure your car wash installation is cost effective, quick and efficient. All of ourautomatic car wash structures and self-service car wash buildings are manufactured using only the best quality products. It’s important to us that our car wash installation meets the same high standards. Prior to your car wash installation, it’s important to consider a few factors that will impact your business. Choosing the appropriate building placement is critical for making certain your car wash can handle the flow of traffic you expect. Your car wash installation should follow relevant building codes and your building should be placed on a lot of land large enough to accommodate at least 2 cars stacked behind one another waiting to use your service. Depending on the typical weather conditions, you may want to consider positioning your building towards the sun to avoid ice buildup and other weather-related issues during the winter season. Finally, before starting your car wash installation, decide if you plan on offering inside or outside bays or a combination of the two. Car wash installation also includes vacuums and other equipment that are considered part of your business. It is important to your car wash installation that you place these items appropriately so they are useful, but do not impede the flow of traffic into the washing area. In addition, before your car wash installation is complete, you will need to decide on the most appropriate features or options that your car wash will offer. Do you plan on offering self-service washes as well as automatic? Decide ahead of time if your car wash business will include tire cleaner and presoak systems. Making decisions on these features ahead of time will ensure your car wash installation is designed around these options and goes as smoothly as possible without interruption. Other options to consider before car wash installation include floor heating systems in cold weather climates, or radiant tube heaters, vending products and even bill changers. Many of these features will most likely precede your car wash installation, making it easier to coordinate the perfect location for your car wash building. Ensuring a smooth, car wash installation requires preparation. New Horizons car wash installers will work with you to create the easiest, most efficient car wash installation possible. From site preparation to permitting, there are many variables involved and it can get a bit overwhelming. 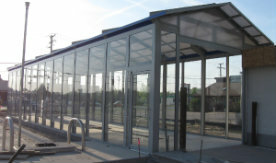 Having our car wash builders create a quality glass structure is the first step in professional car wash installation. Our team has the knowledge and skills to ensure your car wash installation is conducted efficiently, professionally and in the least amount of time possible. Trust the experts at New Horizons for a quality car wash structure so you can spend less time worrying and more time making money. Contact us today to get started!